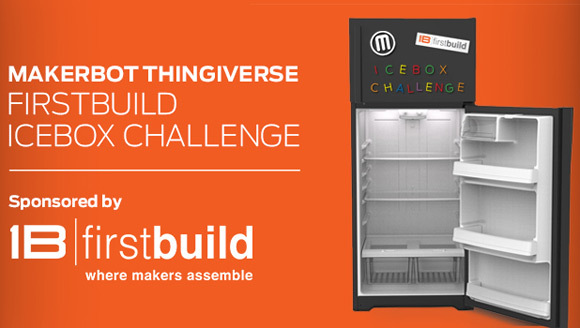 The FirstBuild Thingiverse Icebox Challenge is aimed at designing solutions that can be placed inside of the refrigerator. Ideas could range from purely 3D printed pieces to battery-operated electromechanical devices. FirstBuild’s engineers have already gotten inspired about this Ice Box Challenge and have designed test prints that include a 3D printed pizza box holder, customizable to the size of the box and the shelves in the refrigerator, and a motorized 3D printed wine chiller. To qualify, designs must be uploaded to firstbuild.com between November 3 and November 23, 2014, at 11:59 p.m. EST. Entrants are also encouraged to upload their entries to thingiverse.com using the tag #IceBoxChallenge for a chance to be featured on the Thingiverse site. 3D print testing, online community voting and judging will occur from November 27 to December 2, with the winner announced December 15. First place winner will choose between a MakerBot Replicator Desktop 3D Printer or a MakerBot Replicator 2X Experimental 3D Printer. Second place winner will receive a MakerBot Replicator Mini Compact 3D Printer and third place will receive three spools of MakerBot Filament, a Thingiverse T-shirt, a FirstBuild T-shirt. The participants that get the first to third place will also get their creation featured on Thingiverse and displayed in MakerBot Retail Stores. So far there are 19 entries into the contest already sent with a little over 15 days left for everyone to join in by submitting his or hers entry.